Have you considered adding cycling or bicycling into your fitness routine? Biking is a mode of exercise that boasts many benefits. It’s a non-impact, full body, functional and economical, as well as an adjustable intensity workout. Non-impact exercise basically means there’s no jarring or impact on your bones and joints in the exercise. 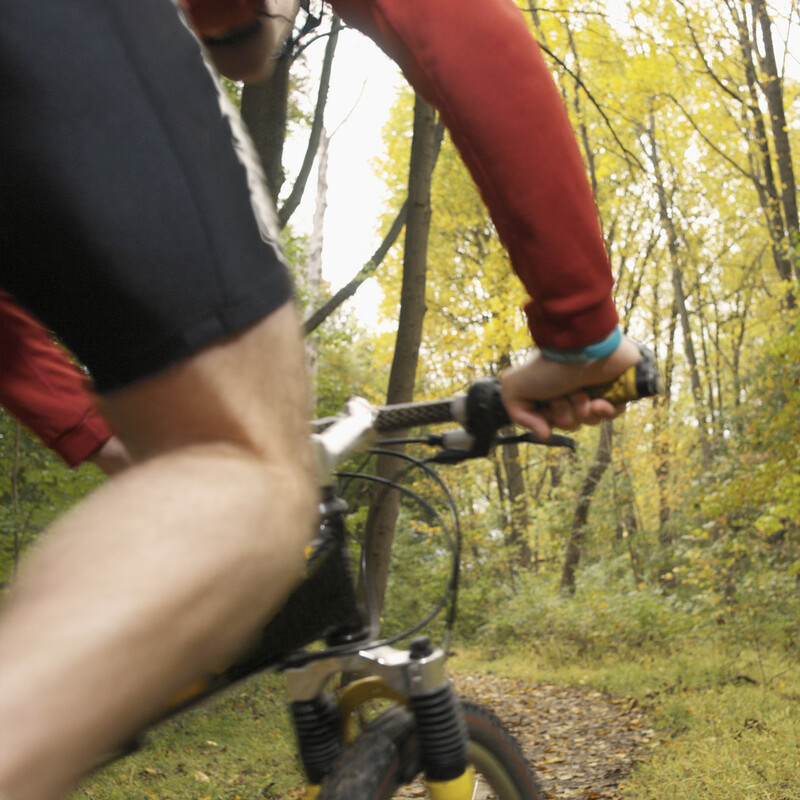 If you’ve experienced joint injuries, biking may be a good choice. Biking could also be considered a full body workout if you’re keeping your upper body and core under tension by maintaining proper posture and spinal alignment while cycling. If you’re planning to head to the trails on your bike, the terrain alone will have all your muscles working the entire time, while also testing your bike handling skills. As a functional and economical exercise, biking to and from running errands, commuting to work or simply leaving the car at home on the weekends and heading out your bike, will ease finances from having to fill up your gas tank. Cycling is also an adjustable exercise in regards to intensity, enter your bike gears. You can push a harder gear up a hill or shift to an easier gear and focus on increasing the turn-over of your legs. You can pedal fast, slow or even coast if you’re in need of a break. All in all, most would agree cycling is a workout to consider. Helmet: Helmets are a must. There are road biking helmets, mountain biking helmets, as well as general sport helmets. Choose one based on what type of riding you’ll be doing most. Prices range from $40.00 on up to $200.00 and more. According to the law, all helmets sold in the USA must be approved by the Consumer Products Safety Commission, so be sure to look for their seal of approval. Another quick safety note, any helmet that has been involved in any kind of impact should be replaced, regardless of the external appearance of the helmet. Reflectors: If you’re riding at night, a clear/white light must be attached on the front to either the bicycle or the person, check your state requirements. Riders, by most state law, must be visible for up to 300 feet. Also often required for night riding is a red rear reflector, white or yellow reflectors on the front and back of each pedal, as well as clear/white reflectors on both sides of the front half and back half of your bicycle. Road Rules: Cyclist and drivers follow the same rules of the road. Emergency Contact: Always carry ID and emergency info with you. As far as cycling gear goes, that’s up to you. If you’re riding for long distance, padded cycling shorts may be a good investment. If you’re interested in aerodynamics, consider a riding jersey with a rear pocket to hold your belongings such as your keys and phone. Biking shoes will also allow for an efficient pedal stroke, if you’re considering riding for fitness either on the paved road or dirt trail. 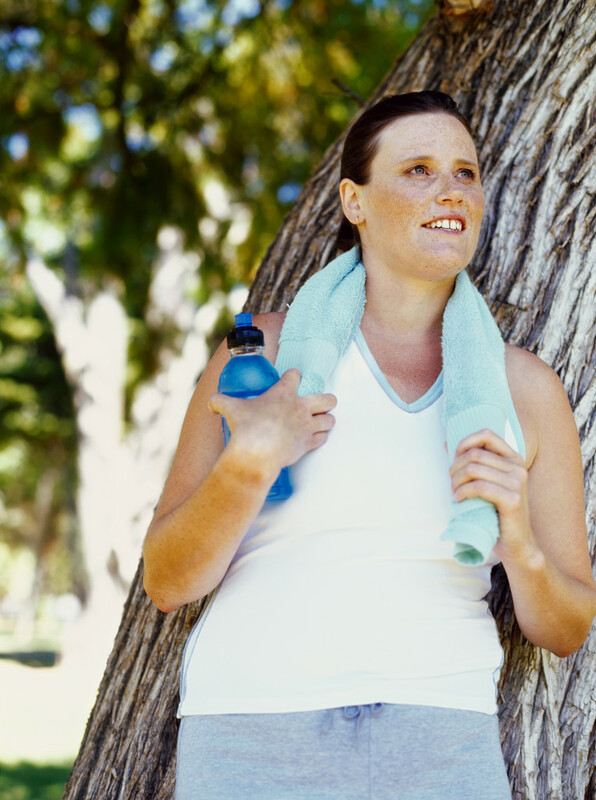 Are you experiencing a mid-year slump in efforts toward your fitness goals? If you’re dreading each workout, bored and uninspired, it’s time to try a few of these mid-year plateau busters to boost inspiration. Race! That’s right, compete! Some adults think they can’t or shouldn’t be competitive or admit wanting to win. However, striving to be the best or wanting to place in your age group, paying attention to time splits and wanting to pass others on the course is perfectly acceptable in athletic competition. Go ahead; keep time on a stop watch, push hard, announce wanting to finish first or set a personal record! And you’ll discover a secret in the process, competing is a great method how to improve or get better in your sport or activity. Take in a change of scenery. For example, pack up your bike and head to a neighboring town or city for your regular Saturday ride will eliminate exercise staleness. Carpool with friends to a different area of town for your long run is also a fun option to mix up the mundane same old running route. Conduct a search online for information pertaining to the specific activity, including roads, and safety notes, then invite some friends and embark on a fitness focused road-trip. Having to refer to a map or notes on the new area, along with new and different scenery will keep you engaged and interested. Daydream! Bring back the daydreaming days of childhood. Ask yourself, if you could undertake any physical activity, what would it be? Whether you dreamed of being a prima ballerina or the greatest baseball player of all time, why not take action to participate in that activity now. Look up adult ballet classes at the city recreation center or check out city league baseball teams. Instead of worrying how you’ll find the time, motivation or fitness level to achieve your daydream, start from the goal and work backwards. Ask for help, ask to be held accountable and start! Let go of the structure that usually governs your day as adults, and embrace the freedom and creativity that sport and being active brings. Thinking about what moves you, will lead to figuring out what will make you want to move more. Everyone in your surroundings will benefit as your mood will improve, focus on tasks will increase due to be just generally happier and you’ll inspire many others in the process! So head on out to a race, organize an activity focused group, take a fitness field trip or simply daydream. Find what works and the mental fitness plateau won’t stand a chance! Jump Rope. 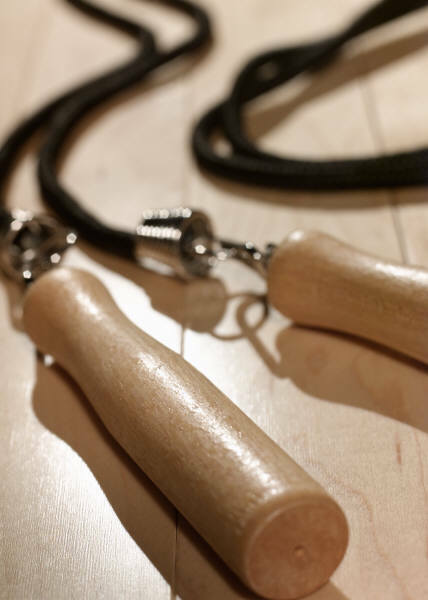 Jumping Rope is high impact and is high intensity, and it also burns a ton of calories. Start with intervals and build from there. Begin with thirty-seconds to two minutes of moderately paced jumping, followed by walking for about a minute or two to allow your heart rate to stay in your aerobic zone. Be sure to warm up with walking for 10 minutes prior to your first interval, as well as cooling down with walking to return your heart rate to pre-exercise levels. Exercise Band. Exercise bands provide resistance for our muscles. 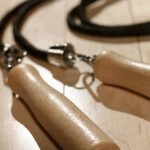 They’re portable and easy to adjust the intensity. If you’re new to exercising with the band and are focusing on building arm strength, try a standing bicep curl. Stand on the band with your feet hip-width apart, hold a handle in each hand along side of your body. 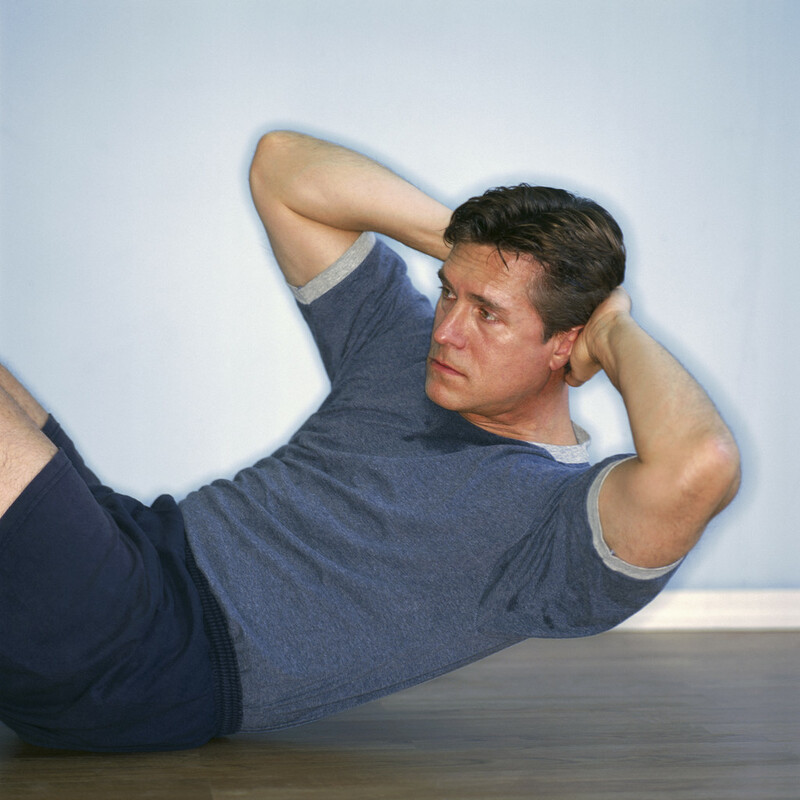 Keep your torso straight, with your abdominals pulled in tight. Turn your palms to face forward. Bending from your elbows, pull your arms up so your palms are facing your shoulders. Slowly extend your arms again and return to your starting position. Repeat 10 times to start. Balance Disk. Balance disks are similar to stability balls, just smaller. Their size allows them to provide an unstable surface to sit or stand on, while occupying much less room. If you’re new to exercising with the disk, as well as working on building core strength, try sitting on the disk. With your knees at 90-degrees, pull both feet up and off the floor. Hold for a count of 10 seconds to start and build from there. Place both arms across your chest, keeping your torso straight and abdominals pulled in tight. Work in a shorter range of motion. When performing a motion, stop where you feel the most tension in your muscle, and then work your range of motion around that angle eliminating the full bending and straightening of your joint. For example, when lowering into a squat stop when your thighs are parallel to the floor, and then push up only about two inches before lowering back to the parallel to the floor position. Only return to your straight leg upright position every third or fourth rep.
Add in cardio-bursts. Take a few minutes at regular intervals during your cardio workout and double up the intensity into a sprint. For example, every three minutes perform a high speed sprint interval lasting from twenty seconds to one minute. Keeping the cadence high and piling on the resistance for a muscle overload for twenty to thirty seconds will also serve as a cardio burst. Do back to back exercises. Choosing two or more moves for the same muscle group or movement pattern together without rest will improve difficulty due to a reduced rest cycle. For example do a set of cable pulldowns, immediately followed by a standing dumbbell row, immediately followed by a free-weight single arm row. Do ten to twelve reps each, followed by a thirty second rest. Then repeat the two or three moves until all sets are complete. Increase your weights to lift with heft. 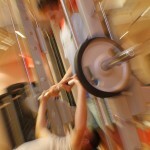 Adding weight will increase the overload on our muscles to promote strength results. Try adding an extra plate of weight or choosing the next set of dumbbells for one set or several sets, then decrease reps if needed. Be sure to keep your movement pace under control and safe, being mindful of posture and stability. 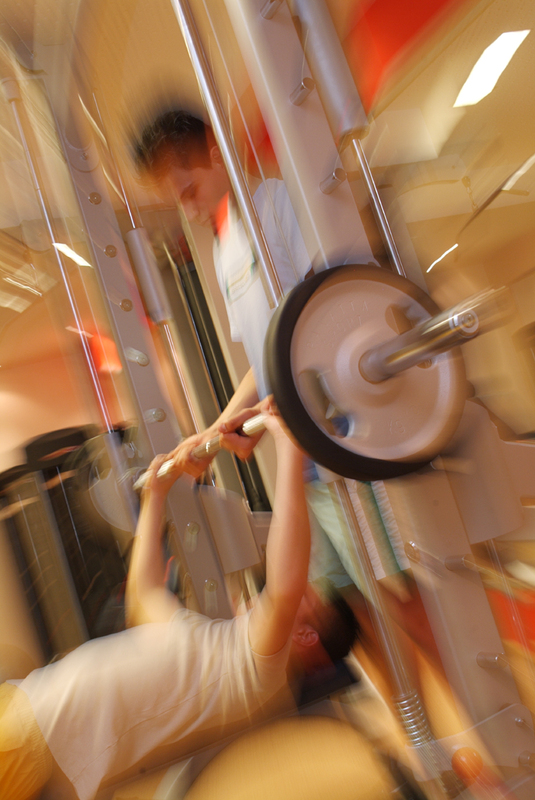 Slow down your reps. Increasing the time muscles are kept under tension will fire up muscular endurance. Pay attention to continue breathing at your normal rate and keep your stabilizing muscles engaged so only the goal muscles are working. Look to those you know who’ve staged an exercise comeback after a setback for inspiration and motivation. One thing all comebacks have in common whether sports related, work related or otherwise; the comeback kid always says all the hard work was worthwhile. No one has ever regretted it. Here are 6 steps to stage your best comeback yet! Review. Retrace steps to determine where you strayed from your goal. Research. Are there pieces of the puzzle that you’ve been missing? 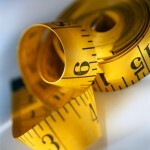 Maybe there is a new technology or method to make your goal easier to accomplish. Be Vulnerable. Everyone makes mistakes and poor decisions. Don’t be afraid to let others know you’ve slacked off in your progress. If they know you are struggling, they may be able to help get you back on track. Progress is Cumulative. 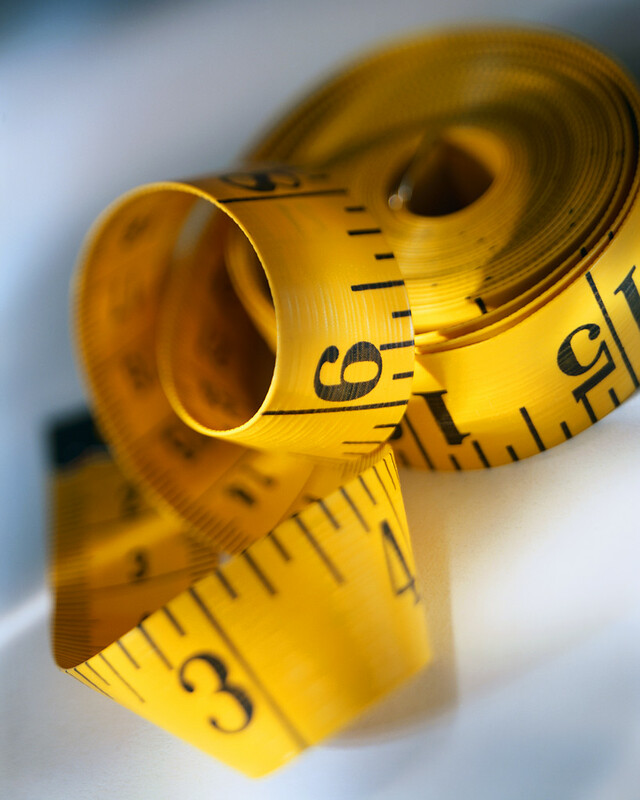 Even if you falter on your way to your goal, exercise is cumulative. Every little bit counts. Stay out of the all or none mindset. You are not starting at zero again, simply start where you are! Accept Responsibility. YOU ate the cookies, YOU slept in, YOU skipped your run. Take responsibility, and then move on. Leave the Past in the Past. Focus forward. The past is the past, so leave it there. Acknowledge it, learn from it and then let it go. So if you’ve strayed from your exercise and fitness goal, stage your comeback. A comeback takes planning, consistency, hard work and dedication…and you’ll never regret it! POWER UP your workout motivation! Join #HealthyWayMag Fitness Chat tomorrow, Monday January 26, 2015 at 5pm(Pacific)/8pm(Eastern) on Twitter. How does it work? Simply log into Twitter, enter #HealthyWayMag to join in the conversation as we chat all things fitness. Follow along with questions, offer your answers, chat with others and GET MOTIVATED! Tomorrow, January 26th Fitness Chat is Sponsored by MilestonePod! No more guessing when to replace your running shoes. MilestonePod is the easiest way to track miles on your shoes. Follow them on Twitter @MilestonePod. This is an Add-On Workout. Add on the fun by adding one exercise at a time! Super efficient and super fun. Begin doing #1, then #2, then #1. Then do #3, #2, #1. Repeat until you’ve completed #7- #1. Getting fit doesn’t always happen in the gym. You can workout at home! Do each exercise back to back, only resting during the designated rest interval. 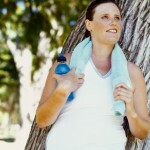 Exercises are for intermediate exercisers, without injury. Perform exercises at your own risk. Squat Jumps: 20 seconds work, 10 seconds rest. Pushups: 20 seconds work, 10 seconds rest. Skater Lunges: 20 seconds work, 10 seconds rest. Burpees: 20 seconds work, 10 seconds rest. Mountain Climbers: 20 seconds work, 10 seconds rest. Perform up to 4 rounds each.